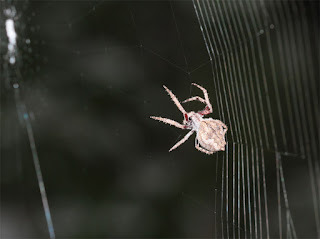 Each year I have a group of spiders who I visit every day or night, depending on who and where and when they are out and about. I will blog some of them as The Regulars. Here's a few to start with. The stunners as usual are the garden orb weavers. 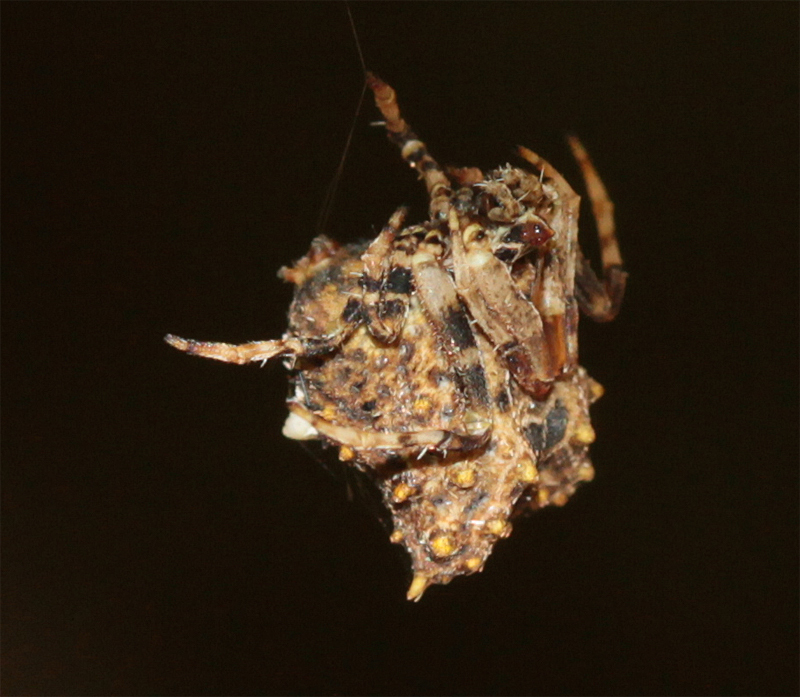 We'll start with two, both Eriophora pustulosa, (family Araneidae) the most common species here in Castlemaine. I have named them, rather unoriginally, Erio-first and Erio-second. They live in the car-port and under the roof slats of an outdoor space respectively. 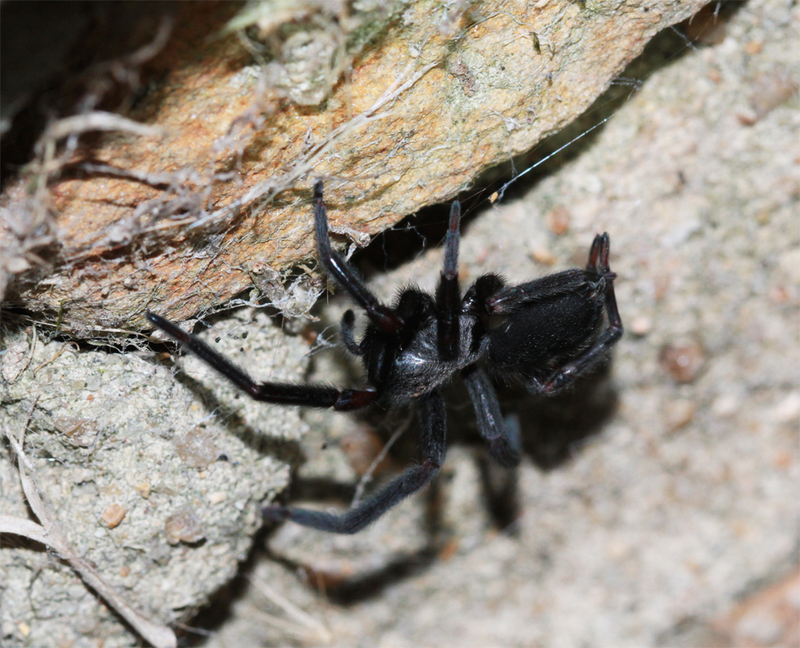 I have so many blackhouse spiders that I would love to introduce, mostly Badumna insignis (family Desidae). There's Badumnina on the kitchen window. And Bumdiddy, who has to date always had her rear end protruding from her retreat. I have never seen her otherwise. Fortunately, she has a very cute rear end. Plus Equinina, so named because she lives behind an outdoor art work of a horse. There's also Bedheadia who lives just above my pillow in my bedroom. She's the little cousin, Badumna longinqua, a brown house spider. The photo is Stoned, a full grown female blackhouse who lives in the stone wall and was weaving silk at a frantic rate tonight. There are lots of daddy long-legs, of course (Pholcus phalagiodes, family Pholcidae). 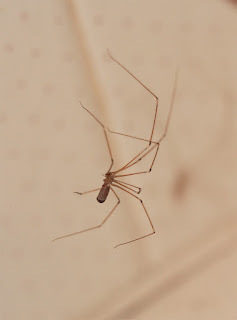 Please meet Violet-long-legs. She lives behind the African violets in the bathroom. And then there's a confusing little spider. I had no idea what she was. A Facebook callout and Trevor Leaman had her sussed within minutes. She's a bird dropping spider, just not the one I am used to. We think that she's Celaenia calotoides (family Araneidae), so I shall call her Celaenia because it is such a pretty name. There is a lot more to say about each of them and quite a few more. Badumnina in particular is being very active and interesting. But that will all have to wait for further blogs. It is so good to have the season off and running! Thank you so much, Kristina. I am hoping to blog my spiders more, but I am away a lot for talks about my latest book, "The Memory Code', or doing writing festivals. But my big love are the spiders. I miss them when I am away. Of the Regulars, I have now lost Erio-first and Celaenia, and have twice very nearly lost Bedheadia. We have saved Bedheadia's life from attack of two different spiders. I am away for a writers' festival at the moment, but the first thing I shall do when I get home os check her. I have never been called all those nice things before. I think 'generally grown-up' is the best thing ever - mostly mature but with moments of no having to be an adult. Perfect! I do hope that you will start keeping tabs on your spider-neighbours again, and let me know what you see. Aw, RIP Erio-first and Celaenia, what a bummer. Bedheadia better take good care of herself, after all she's your dreamcatcher! Anyway, sadly I no longer have any buddies to keep tabs on, since I no longer live at the house I grew up in that had a backyard/shed/other spider friendly spots. The only spiders that I've seen in my apartment are usually wolf spiders or other very on-the-go type species, so they don't stick around. On another note, I actually just started my very first blog. 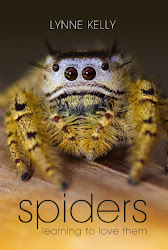 It's a personal blog with no particular theme as of yet, and I thought I'd mention you and your spiders, because I felt like it. I'm new to this and don't know whether you're supposed to ask permission to mention somebody, so I'm asking just in case. You don't need permission to quote something which is in the public domain. It is a complement. Please put a link to your blog here! Nope, not even daddy-long-legs. My apartment is infuriatingly clean. My blog is blackseamermaid.wordpress.com. It was born yesterday! I have a gift at avoiding housework and blaming it on protecting the spiders. So plenty of daddy long-legs. The blog looks great! Congratulations. Such interesting ideas. Accepting the inevitability of failing sometimes is a great theme (among the rest). My life changed when I stopped saying that I was a hobby writer on the side and just said that I was a failed writer. The change in mindset made me act mroe like a professional writer. I had two book contracts within 6 months.